Sarah will tell you that the values she learned at Hawken led her into a lifetime of doing good for other people, particularly people undergoing great upheavals such as refugees from Syria and other war-torn countries around the world. After Hawken, she attended Connecticut College and later received her Master’s degree from Harvard and her Doctorate from Columbia. She joined the Peace Corps, where she lived for two years in Southern Africa. She joined the International Rescue Committee and serves as the director for global education, overseeing education for refugees and war-affected children in 40 countries. Sarah and her team worked for 2 ½ years, in conjunction with Sesame Street, securing a $100 million grant from the MacArthur Foundation, which was offered as a competition to non-profits who would tackle a global issue with real solutions. Two thousand non-profits submitted proposals. In late 2017, IRC and Sesame Street were awarded this grant, the largest ever given out by the Foundation, and the largest early childhood program in a humanitarian response. It will provide early care and education to young children in Syria, Iraq, Jordan and Lebanon that will enhance their social-emotional wellbeing and reading and math skills. 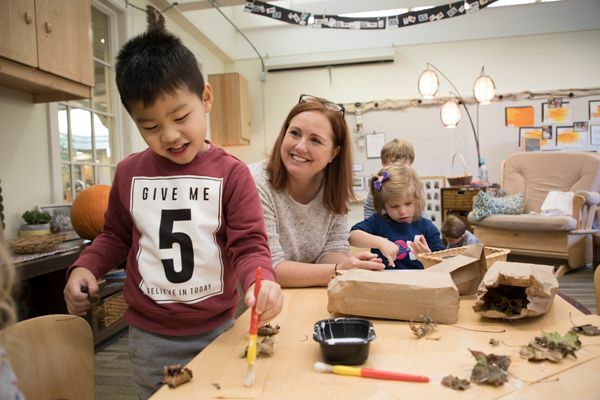 When a journalist asked her recently how she became interested in early childhood education she recalled her Hawken senior project, where she worked as a Head Start teaching assistant at Cleveland Works. Sarah’s work is relevant, essential, challenging, and life changing on a global scale. At Hawken, Sarah was a member of the field hockey and softball teams and her sister, Meredith Smith Weil, graduated in 1985. Her global humanitarian efforts have rendered benefits to countless refugees and, by association, to Hawken School. Click here to nominate a deserving recipient today. Since the late 1990s, Shari Loveman Goldberg has been a passionate and tireless advocate for those touched by autism. She founded the Cleveland chapter of Autism Speaks, serving as president beginning in 2006. Shari brought this organization to the northeast Ohio region and facilitated its growth as a primary resource for those seeking information, education, and support. Through her visionary efforts, Shari has pushed autism onto the radar screen of the community. She has developed high profile annual fundraising events, engaging celebrity chefs, musicians, visual artists, and more in her efforts to raise both awareness and much needed funds. Each year, countless parents, children, families, and members of the community have benefited from her dedication and commitment to this work. Currently, Shari is focusing on transitional issues for adults with special needs including innovative living and program options. She has served on several Boards of Directors over the years including Mandel Jewish Day School formerly known as Agnon School and continues to serve on The Cleveland Jewish News. Shari has also been active with Friendship Circle, was their 1st Walk chair and she and her husband, Michael were honored for their work with the program since they started in Cleveland. Per Shari, “the most influential person at Hawken was my advisor and teacher Mr. Frank Brandt. His kindness, compassion and sensitivity truly impacted my life as a student and a young teacher right out of college.” While at Hawken, Shari was a member of the girls varsity tennis team for four years and was involved with the Hawken Players’ Society production of Lil’ Abner. Shari and her husband, Michael, have two sons, Jackson ’14 and Noah. Her actions with her community work reflect a lifetime of pursuing a higher plane of life. Brooke graduated from Princeton University in 1969 with a degree in English and then worked for two years in the VISTA poverty program to help those less fortunate. Afterward, he moved to Washington, D. C., for a master’s degree in literature and started freelance writing. He wrote for a number of years for Time-Life Books and later, took on writing magazine stories, speeches, and history books. He has published several books including World in the Balance: The Perilous Months of June-October 1940 about the Battle of Britain, which came out in 2011; and, more recently, Steel: From Mine to Mill, the Metal that Made America in 2015. Although he has lived his adult life outside of Cleveland, Brooke has always remained connected to his native city and his alma mater, Hawken. He served as a class news secretary for decades, and for 25 years he has been the president of the Cleveland Club of Washington, D. C. In addition, he is a member of the National Press Club and the Authors Guild, and served for years on the board of the American Society of Journalists and Authors. He has remained an enduring friend of Hawken alumni over the years and is always willing to host alumni whenever they visit Washington. He is married and has three children. Brooke has proven to be someone who can be counted on at any time. He embodies the spirit of Fair Play. Presented by the Hawken School Alumni Association to an alumnus/a who has demonstrated his or her long-standing, selfless, and continuous service “above and beyond” to Hawken School and who embodies Hawken’s central belief of “Fair Play” characterized by integrity, respect, and accountability. Now in his 24th year of teaching at Hawken, Ken Clark has impacted the lives of hundreds of Hawks both in the classroom and on the playing field. Described by a colleague as “a good man through and through, in addition to being an outstanding teacher,” Ken is revered by all who know him. Numerous alumni have openly regarded Mr. Clark as “my favorite teacher of all time;” others thank him for instilling “an appreciation for history’s influence on modern events” and “a disdain for split infinitives.” Yet another alumnus’ words of gratitude, “Thank you for believing in me,” ring true for countless current and former students who had the privilege of being in one of Ken Clark’s classes. 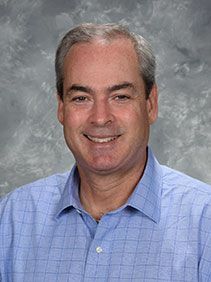 Prior to coming to Hawken in 1994, Ken taught for three years at St. John’s Northwestern Military and Naval Academy in Delafield, Wisconsin. Since his arrival on Hawken’s campus, he has taught history and humanities (and one memorable section of 10th grade English); coached varsity and jv baseball, middle school football, and freshmen basketball; established ties to the national organization Facing History and Ourselves; advised Hawken’s first Model UN and Mock Trial teams; served as class dean for the Classes of 2004, 2008 and 2013; and chaired the History Department from 2008 – 2017. In 1998, he received a GE STAR (Student-Teacher Achievement Recognition) Award and, in 2001, was the recipient of a Hawken Teacher Recognition grant. A graduate of Johns Hopkins University with a master’s degree in history from The Ohio State University, Ken is also the proud father of three Hawks: Jimmy ’18, Rachel ’20, and Tommy ’22. His wife, Beth, taught 8th grade history at Hawken from 1995-2001.